Westwood High School's Tommiana Calhoun (5) looks for an opening, guarded by Crockett's Quenisha Henderson, during a District 20-3A girls' basketball play-in game on Friday in Buffalo. Westwood High School girls' basketball player Tiana Davis (11) shoots over Crockett's Quenisha Henderson in the tie-breaker game at Buffalo on Friday. 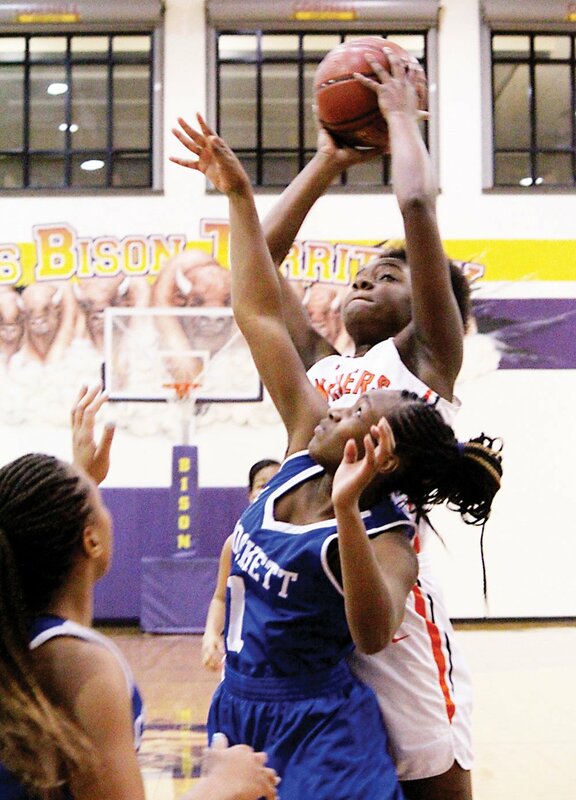 BUFFALO — The Westwood High School girls' basketball team found itself in a 46-32 hole heading into the fourth quarter of a District 20-3A play-in game on Friday. The Lady Panthers clawed with might in the fourth quarter — but Crockett defeated Westwood 60-53 at Buffalo High School’s gymnasium. Westwood head coach Wills Tran reported the Lady Panthers trimmed Crockett's lead to six points during the fourth quarter — but that's as close as they would get. Still, Westwood showed remarkable improvement this season, finishing with a 6-7 mark in District 20-3A and a 12-16 overall. This was the final scholastic game for seniors Monica Wilson, Tori Stephens and Tommiana Calhoun. “The girls set a lot of goals; but, they couldn't quite get that last one,” said Tran, whose style of play has proven to be a match with Westwood's athletes. Tran said the Lady Bulldogs won the game in two critical areas: Rebounding and the transition game. Crockett and Westwood played a close first quarter, with the Lady Bulldogs ahead 12-10. The Lady Panthers were down 29-21 at intermission, and Crockett continued building its edge in the third quarter. Jordan Carter was Westwood's leading scorer with 16 points, including a stellar 6-of-7 on free throws. Wilson added 13 points, including a 3-pointer. Tia Hatten chipped in with 12 points, 10 of them in the fourth quarter. Crockett standout Katelin Holmes was the game's leading scorer with 21 points, including a whopping 11-of-15 from the line. Jaida Lockhart added 17 points as a complement to Holmes. Tonight marks the second night of the University Interscholastic League girls' basketball playoffs, with Cayuga and Slocum both in action. For the second straight year, Cayuga (22-11) will play Centerville in the Conference 2A-Region III playoffs. The LadyCats' game is set for 6 p.m. at Fairfield High School. Slocum (21-10) plays in the same 2A-Region III playoffs tonight— versus District 19-2A champion Kerens at 7:30 p.m. at Leon High School in rural Jewett. Crockett will play District 19-3A champion Franklin at 7:45 p.m. tonight down in Madisonville. Personal fouls: Westwood 20, Crockett 19; Fouled out: None; Technical fouls: None.